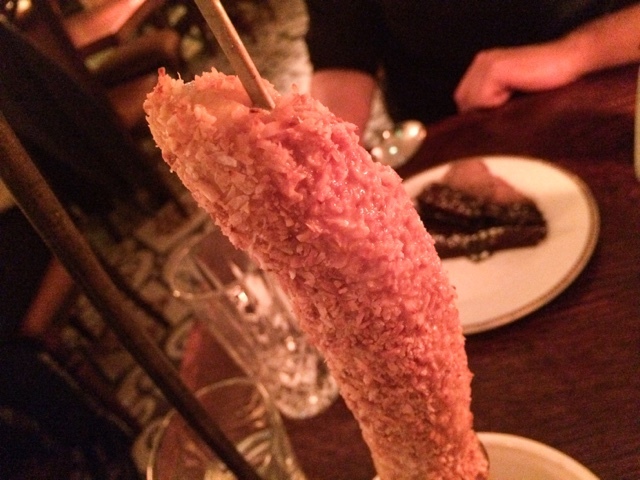 You can’t beat a night of good food, yummy cocktails and live music, and that is exactly what I got when visiting The Trading House* a couple of weeks ago. 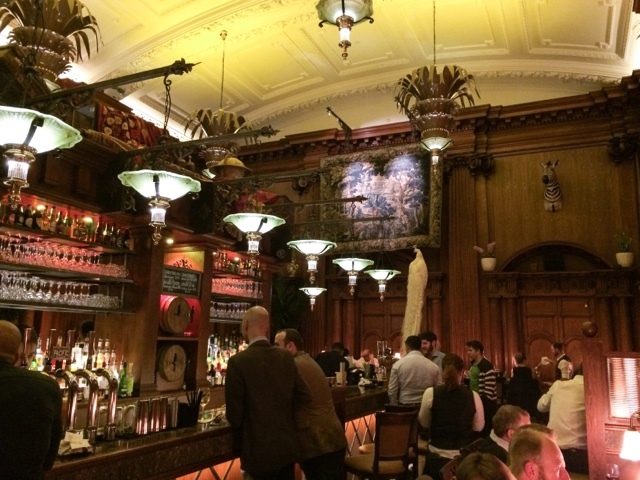 Newly opened in the Bank area of London, The Trading House is housed in an old bank with many of the beautiful original features complete with beautifully panelled walls, high ceilings and a gorgeous wrought iron spiral staircase, which make for a stunning setting in which to dine. Add to the fact that they’ve decorated it with all sorts of treasures and artefacts to recreate a Victorian trading house filled with “particular and peculiar eccentricies, curiosities and antiquities”, and you’ve got quite a sensation for all the senses! We were led through to the back of the bar where tables were laid out for diners, and to my delight even more curiosities (Tony took quite a shine to the white stuffed paraqueet over looking our table!) 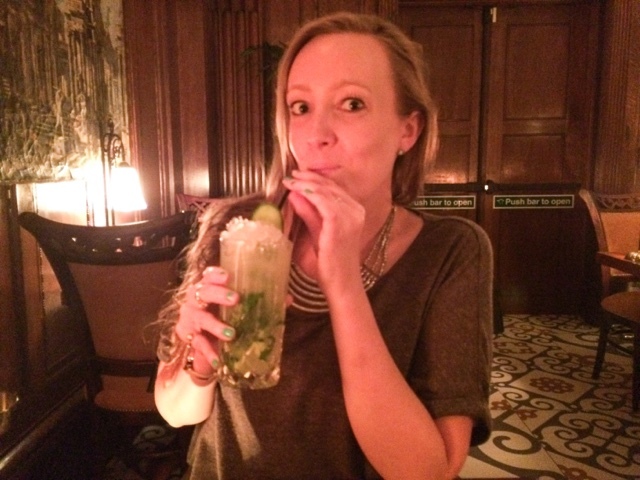 We dove straight into the extensive drinks menu and I finally decided on an English Mojito (£7.95), which put a gin twist on the classic Mojito, and included Bombay, cucumber, mint, sugar, lime, apple juice and apple liqueur. My kind of cocktail! It was absolutely delicious, and not too sweet which I worried it might be with the sugar and apple juice but it was actually really refreshing. It came in a classic tall glass cut tumbler as well, which made it feel quite special (and one of my pet peeves is ordering a cocktail which turns up in a cheap plastic cup!) Tony decided to start with a beer and was really impressed with the large range of craft beers from around the world on offer. 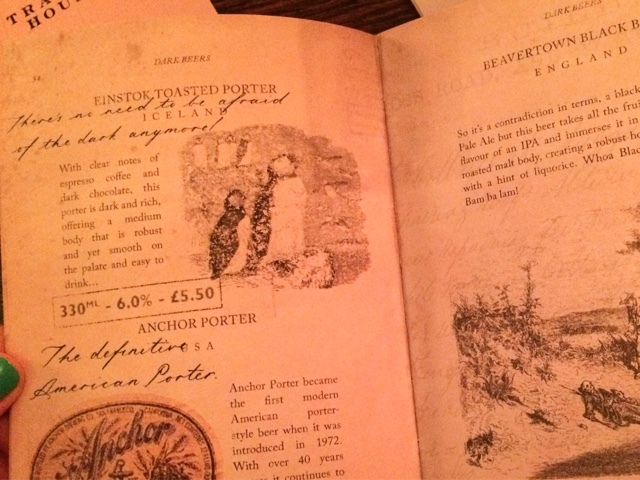 I loved the beer menu as it was set in its own little leather bound book called “The Ancestry of Ales, An Acclamation of Brewed Miscellany” and each beer detailed where it was from, what flavours to expect and some had cute little illustrations next to them too. It’s little touches like this which made me fall in love with The Trading House! We then turned to the food menu which is quite eclectic but which ultimately I would describe as typical gastropub cuisine. The starters all sounded incredible and perfect for shared nibbles amongst a group. They also do deli boards which allow you to pick four items from a selection and are served with Turkish flatbread which would be perfect for an afterwork graze or lunch time snacking. We decided to go for the Calamari with lemon mayonnaise (£6.25) and Cumberland and pork chipolatas with honey grain mustard (£3.75). The calamari was absolutely delicious with a slightly spicy and really crispy coating. 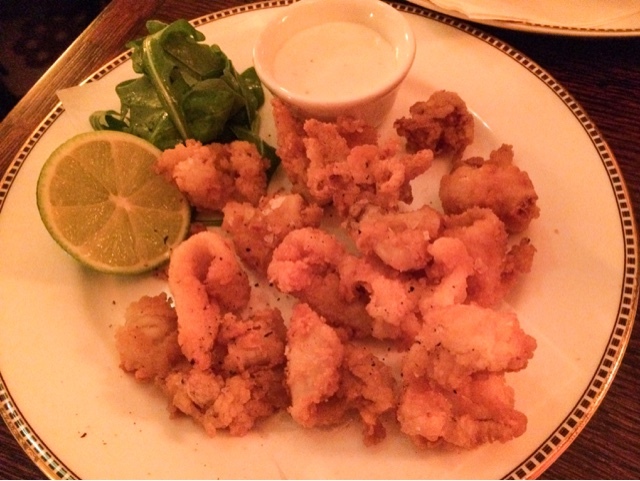 Calamari is a bit of a favourite of my boyfriend and I and we both agreed it was some of the best we’ve had in a UK restaurant – a big shout indeed! 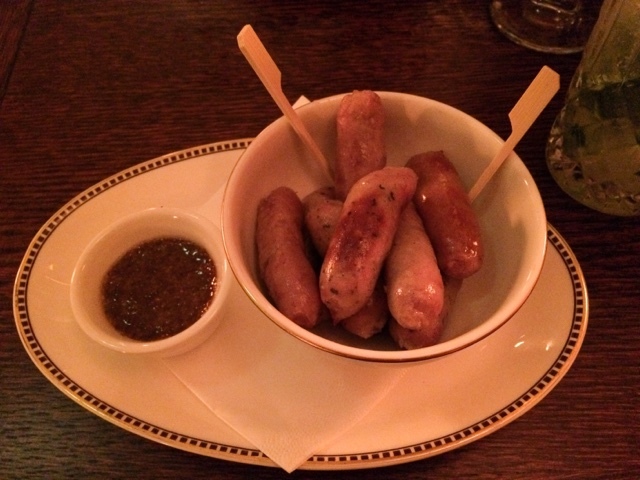 The chipolatas were also really nice and I loved the sticky whole grain mustard dip, they’d definitely be the perfect accompaniment to post work beers! 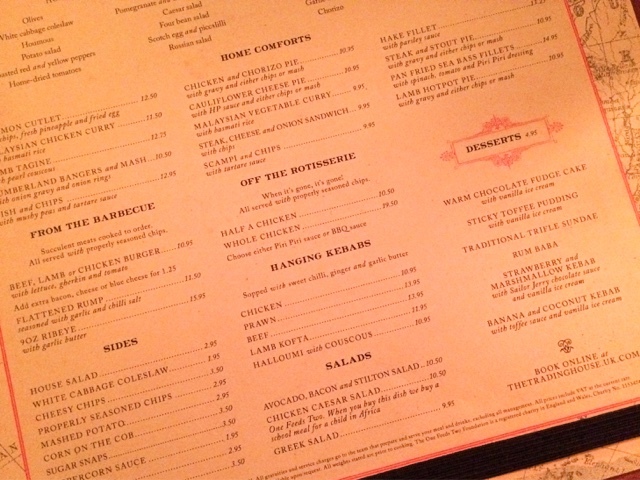 The menu is so varied and it took me absolutely aaaagees to decide what I wanted for my main course – it all sounded amazing! 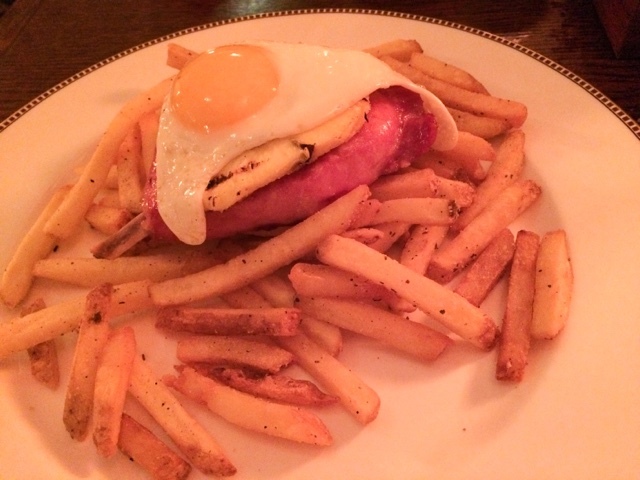 In the end I went for the Gammon Cutlet with chips, fresh pineapple and fried egg (£12.50) as obviously I’d not had enough pork in the starter! 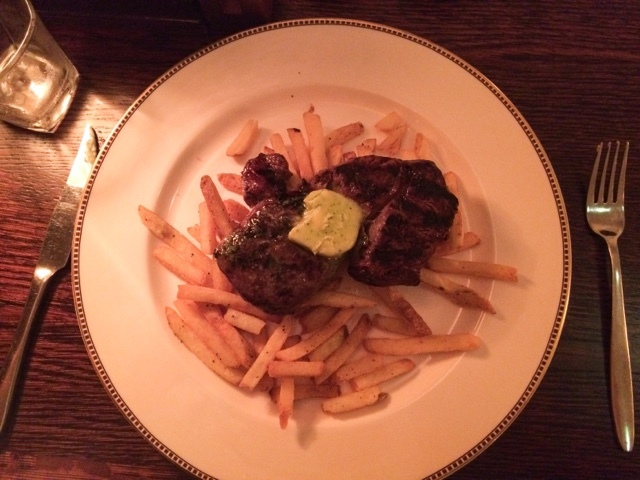 Tony went for the 9oz Ribeye steak with garlic butter and properly seasoned chips (£15.95). These are both pretty classic orders for each of us and gammon is literally one of my favourite foods – big hype to live up to The Trading House! And again I was so impressed! The gammon was thickly cut and on the bone, and cooked perfectly so it practically melted in my mouth. The egg was also really nice, with the white cooked through and a runny yolk. Tony’s steak was also really well cooked and was super tender. It came with a good amount of garlic butter too, as there’s nothing worse than running out of garlic butter midway through your meal, is there?! Both our chips really were properly seasoned as the menu said too, with hot black pepper and just the right amount of salt. Perfect! 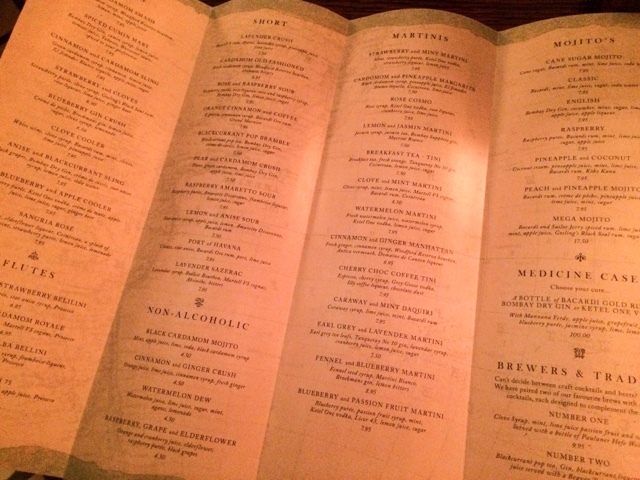 We also ordered a couple more drinks to accompany our mains and I went for the Watermelon Martini (fresh watermelon juice, watermelon syrup, Ketel One vodka, lemon juice and sugar, £7.95) whilst Toto ordered a Brockmans gin and tonic (£9.95). My cocktail was SO GOOD! 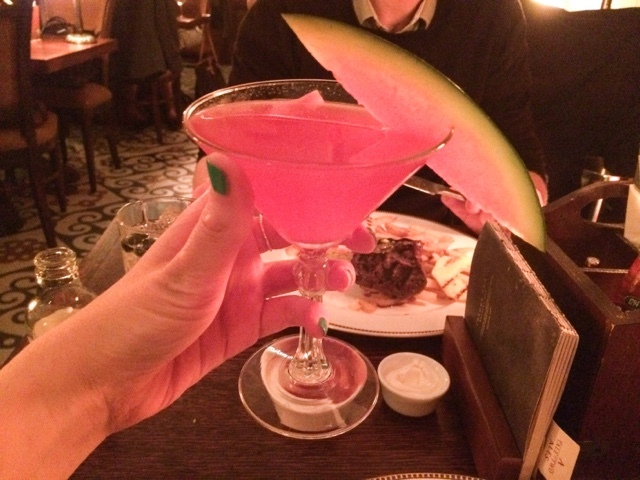 It also looked oh-so-Instagram-worthy – vivid pink and served in a classic martini glass with a slice of watermelon. What more could a girl want?! If you’re a gin fan you have to try Brockmans! It’s made with blueberries and is so delicious! It’s not often you see it in bars and restaurants so I definitely recommend ordering one next time you do. 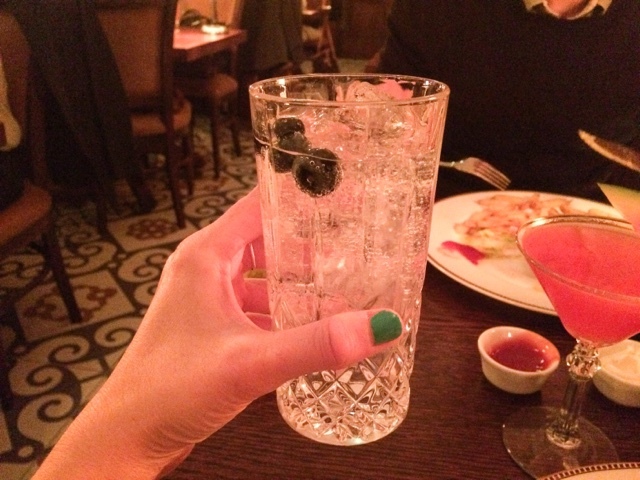 It came as a double measure served in a tall cut glass with plenty of ice and a sprinkling of blueberries on top. Despite feeling pretty full from two delicious courses we decided it would be rude not to order a dessert each as well (what bikini diet?!) especially as the menu included treats such as sticky toffee pudding, warm chocolate fudge cake and – Tony’s ultimate fave – traditional trifle sundae! We decided to share the warm chocolate fudge cake with ice cream (£4.95) and the intriguing sounding banana and coconut kebab with toffee sauce and ice cream (£4.95). 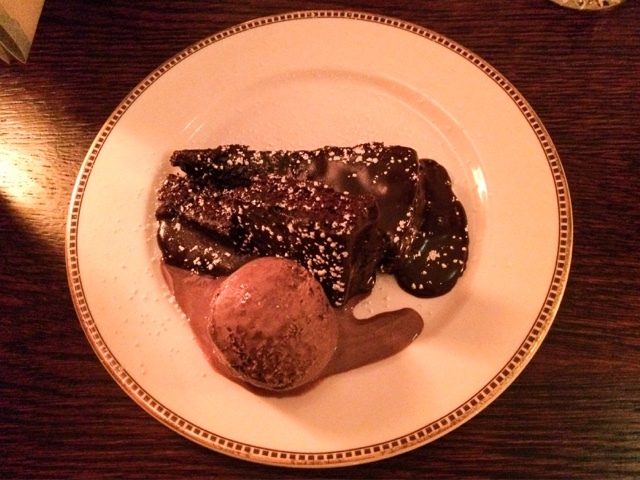 The fudge cake was very rich and chocolatey and moist (*shudder*, hate that word!) and was also a huge slice! YUM! 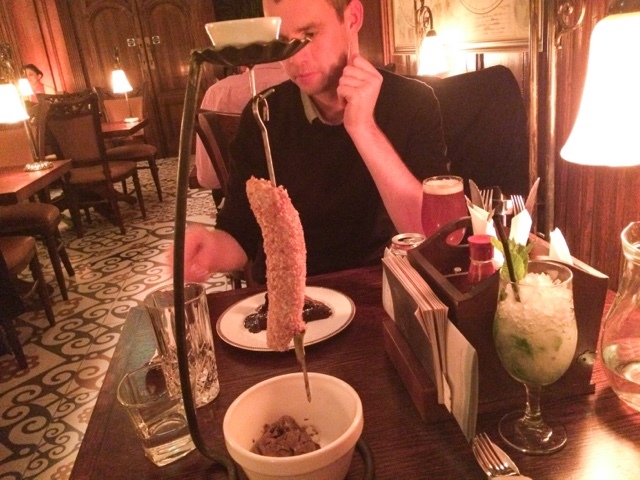 The banana and coconut kebab was such a surprise when it came out – we were expecting slices of banana and coconut on a skewer, but oh no! 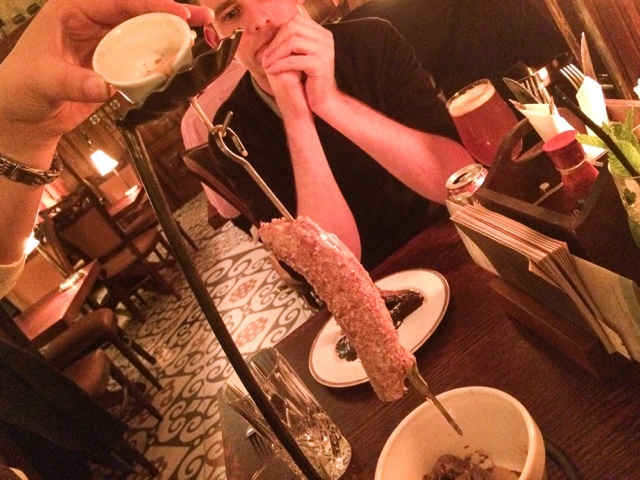 It was a whole peeled banana coated in coconut and served on a hanging kebab stand! Beneath the banana sat a bowl with the ice cream and at the top of the stand sat a little dish filled with toffee sauce which our waitress poured down a small hole at the top of the hanger, so that it dribbled deliciously down the banana, with any excess pooling in the ice cream at the bottom! Amazing! (Though quite hard to photograph!) It was really fun to have such a different dessert, though was slightly tricky to eat as the banana was whole. We ended up taking it all off the skewer and slicing into the ice cream bowl to eat and the flavours were so lovely all together. The textures of the soft banana and crisp coconut went really well together and the cold ice cream and warm toffee sauce complimented each other so well. Of course we decided to order one last round of drinks to enjoy with our desserts and take us through the post food chatting! 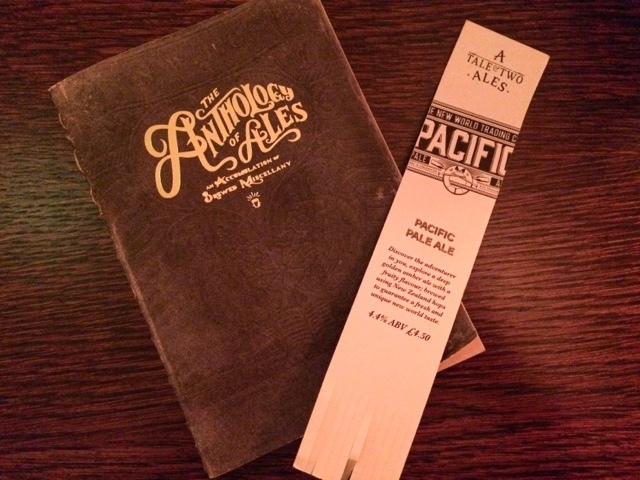 Whilst Tony decided on another beer from “The Anthology of Ales”, I chose a Classic Mojito (£7.95) as I enjoyed my earlier English one so much. 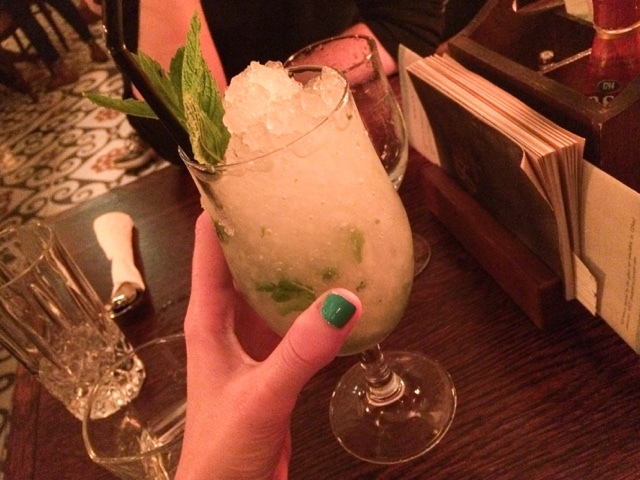 It came served over crushed ice with lovely big mint leaves which was perfectly refreshing at the end of a big meal. 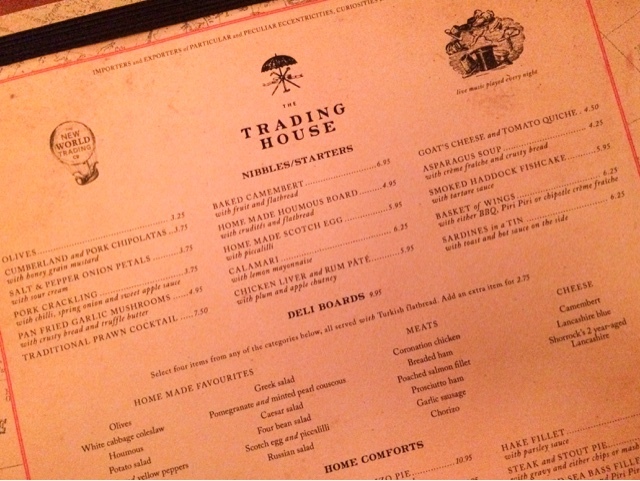 We absolutely loved our meal at The Trading House and will definitely be returning soon. 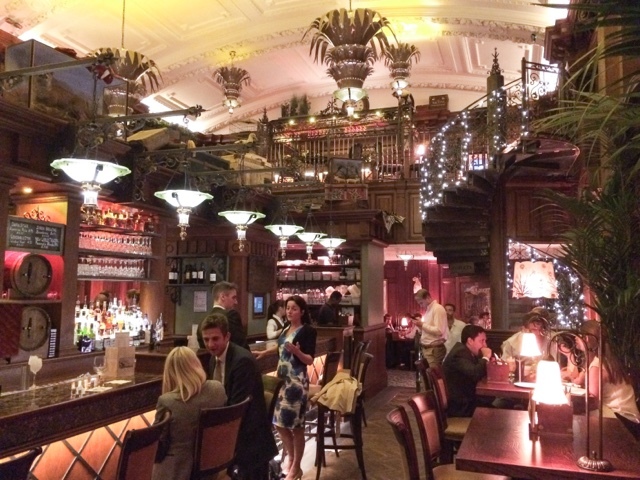 The food was amazing and such good value, particularly for its city centre location. The drinks were also delicious, and again very well priced. 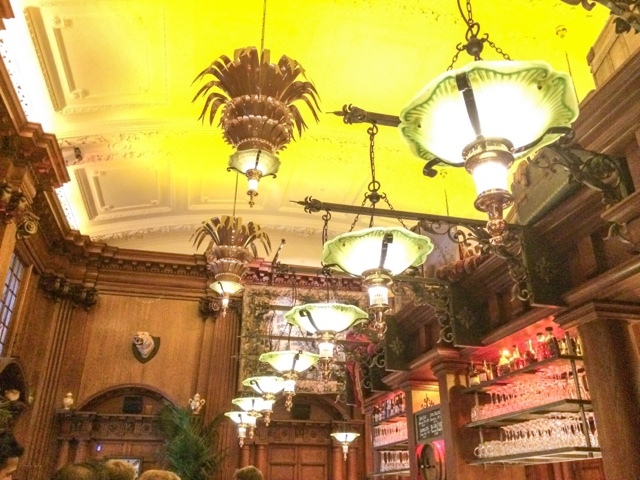 The decor was a perfect mix of grand and exciting with the various peculiarities and eccentricities on display (though if you’re particularly offended by stuffed animals perhaps it’s not the place for you!) 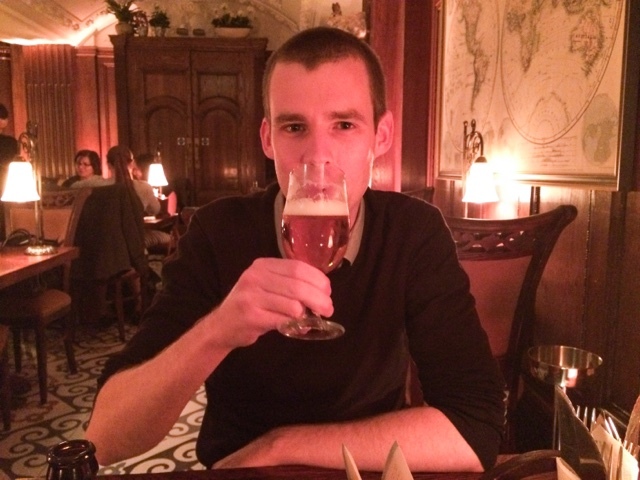 The atmosphere was also great – upbeat, buzzy and very fun and I love that they have live music playing every night. What more do you want from an evening out?! 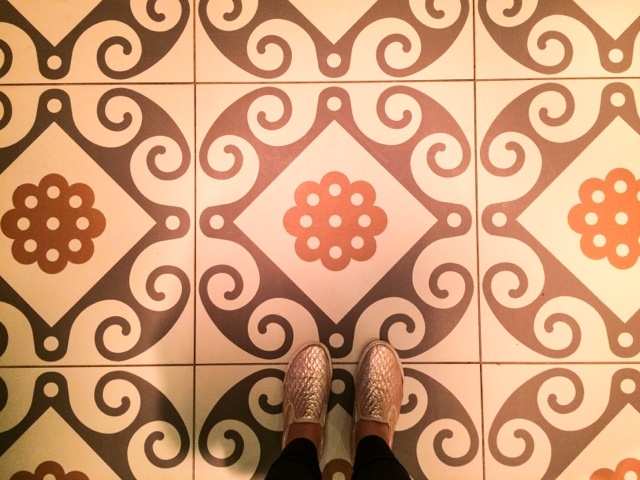 The Trading House lovelies have also really kindly offered you guys 20% off of food if you book using this link: www.thetradinghouse.uk.com/emsypickle – so what are you waiting for?! 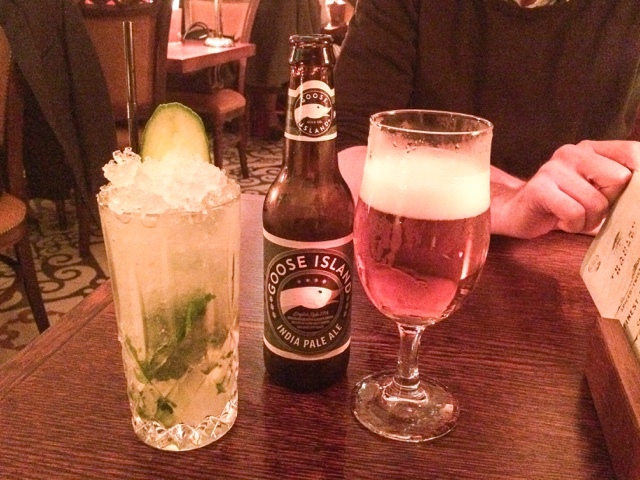 *Thanks so much to The Trading House for inviting us down to sample their food and drinks menu, and for providing emsypickle readers with an offer for 20% off food. All thoughts are honest and my own. For more information please see my Disclaimer Page.